From the Museum of Ice Cream to Candytopia, immersive art experiences have been flourishing throughout New York City. Picture an art museum filled with colors, lights, and lots of balloons! Wonder World NYC is an interactive art museum that lets the museum-goers enjoy the exhibits first hand. It is one of the many new and hot installations in NYC. Wonder World NYC is located at Andy Warhol’s old loft in the heart of SoHo. Andy Warhol was an American artist, director, and producer who led the Pop Art Movement. Tianyu Qiu is the young, NYC-based artist who created this exhibit. As soon as you step through the front door, you are immersed in a realm of fantasy and excitement. The two-story exhibition is designed to expand your mind through whimsical art. There are six different rooms, each providing a glimpse of jaw-dropping art. Although the entrance is a little hidden, once found, you are welcomed with a flower-filled staircase. The lobby offers a colorful gift shop, where different art books, souvenirs, and even sweets are sold. From there, you can walk through the first four rooms, located on the first floor. 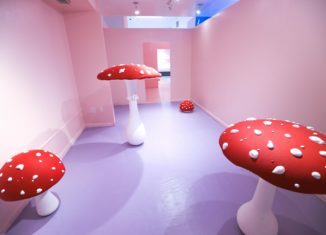 Some of the rooms include a bathtub filled with balloons and cotton ball clouds, a large teacup chair, a fluorescently lit hallway, and their most iconic balloon pit with a giant moon. The walk upstairs brings you towards two more photo opportunities: an infinity mirror room and a room surrounded by colorful stained glass. The pull factor of this exhibit is most definitely the hope of walking out with new Instagram worthy photos. With six different rooms, great lighting, and a plethora of props, visitors of all ages take advantage of the many photo opportunities. This whimsical selfie factory is only open until November 6. If you haven’t done so already, leave Long Island and get lost in Wonder World!